The April issue of Martha Stewart Living is now upon my coffee table, having been quickly scanned until I can devote more time to reading it this weekend. The iPad edition is ready for download and the popular egg-dyeing apps for iPhone and iPod Touch are back this year, this time with more videos and speedier download times. The April issue is really bright with a decidedly modern feel to it. 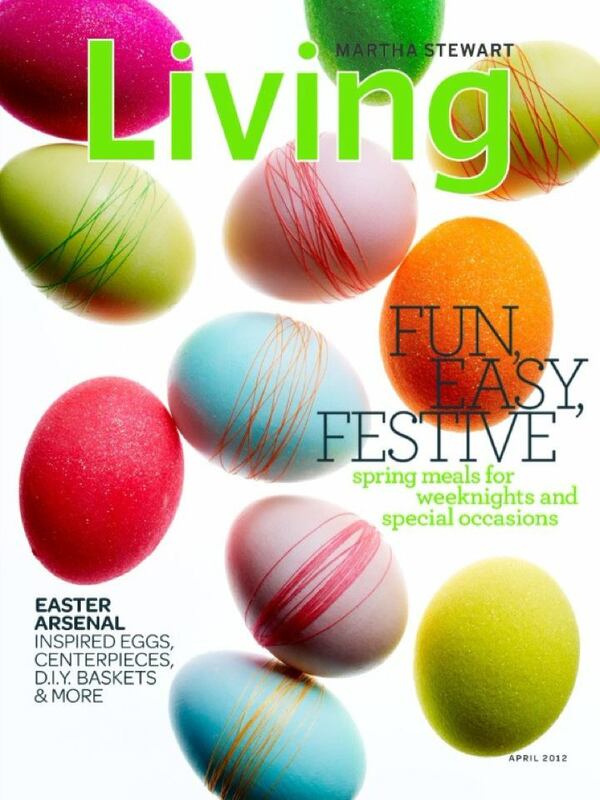 It contains plenty of egg-decorating tips and techniques, desserts that maximize the delightful qualities of eggs, plus flower-arranging ideas, not to mention a really great homekeeping feature on labeling for the organizers among us (that includes me!) which is beautifully photographed by Levi Brown. Watch for this issue on newsstands next week. This is the cover from the iPad version of the magazine. The print version is the same but contains a small typo, as noticed by one my readers, Barbara. It says April 2011 on the cover, instead of April 2012. Oops! (This is only on the subscriber issues; the newsstand issues were corrected.) In any case, I love the gorgeous colours and the bright, modern feel. The magazine also features this really cheeky ad for Martha's new enameled cast-iron pots at Macy's: "Get hot and heavy with Martha." Meeow! Hi Andrew, I downloaded yesterday my April digital issue, the introduction page is amazing with the chicken laying an egg. It is amazing amazing Love it. The new cast iron is at Macy's already, they are great! I never thought of April Fool's Day. If that's true, it's actually pretty clever. The date is correct on the spine.